Quad-core processing is expected to rapidly progress to low-end PCs, meaning that half of all desktops will have it by the end of 2009. The findings were revealed by analyst iSuppli . Currently, pricing for a quad-core processor is as much as 170 per cent higher than for a dual-core chip, it says. The ramp-up is expected to be steep; in the first quarter of 2007 only 16 per cent of performance PCs sold were based on quad-core. By the end of 2007, that number is expected to rise to 33 per cent, and then to 94 per cent by the end of 2009.
iSuppli doesn't expect any penetration of quad-core microprocessors in mainstream notebook PCs until the first quarter of 2009 when just four per cent of new laptops will ship with the new technology. However, we think Intel may have a bone to pick about that. iSuppli defines performance desktop PCs as those priced at $1,000 or more, so the top end of the market will be nearly half quad-core by the middle of next year, bearing in mind the new processor lines from AMD and Intel. However, performance computing represents only 6 per cent of PC shipments. Quad-core penetration in mainstream desktop PCs will rise to 7 per cent by the end of the year. 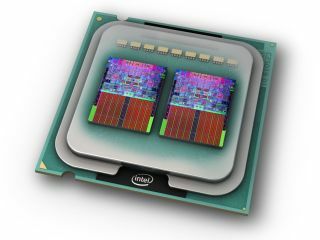 "Quad-core microprocessor technology is coming to the mainstream, and with it is coming capabilities that presently are reserved only for high-end systems," said Matthew Wilkins, a principal analyst at iSuppli. "A quad-core-based PC is very similar to a quad-microprocessor system from the pre-multicore era, such as a workstation or server, which would have been a very high-end system, priced well in excess of $10,000."